We really enjoyed this tasty dinner tonight. It could be made with rice risotto but the barley was delicious, and we often forget to use this healthy grain. Prepare and cook the asparagus in a pot of boiling water for 3-5 minutes. Drain and rinse under cold water. Set the asparagus aside. Saute the onion in the vegan margarine in a large frying pan over moderate heat, stirring until softened. Add the barley and stir to evenly coat and season the barley. Add the wine, 1 cup of the broth and the herbs. Simmer until most of liquid is absorbed and barley is al dente, about 30 minutes. Gradually add remaining cup broth, about 1/4 cup at a time, stirring constantly and letting each addition be absorbed before adding next, until absorbed. Add the nutritional yeast and mix well. 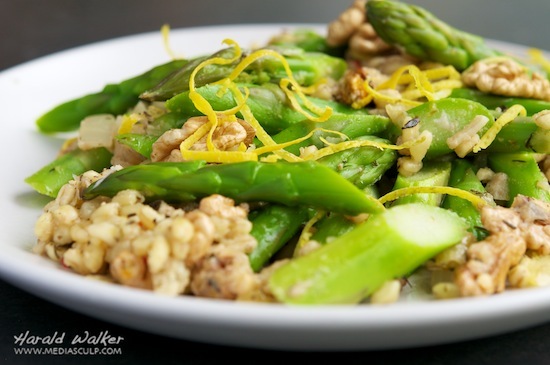 Stir in the asparagus, walnuts, lemon zest, lemon juice. 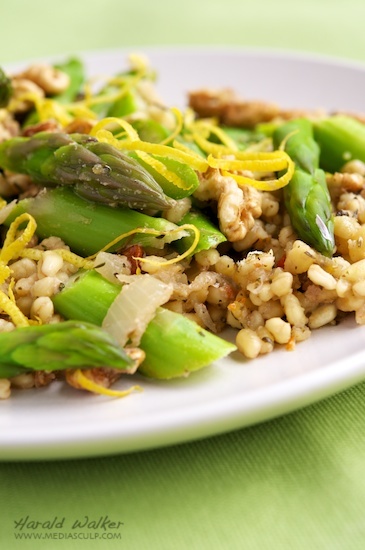 Posted by Chris Walker on May 4, 2012 in Asparagus, Barley, Lemon, Main Dishes, Walnut.